The Excel Add-In1 extends Excel2 with a menu band specialized for barcodes. This makes it possible to insert barcodes into an Excel table with one click and link them directly to a cell content. The optional Add-In represents a considerable simplification for Excel users and developers (VBA). No special or technical barcode know-how is required. Step-by-step example for inserting barcodes with the Add-In. Manual for Barcode Add-In for Excel. The Add-in is optional: You can use the barcode object directly in Excel without the add-in. The usual application of the barcode object in Excel is still available. Simple and flexible integration of barcodes into Excel tables. Move the cursor to the desired cell - Insert barcode - Done. Barcodes can be linked with Excel cells so that the barcode changes automatically when the cell content changes. Insert barcodes in the table as needed: Right from the cell, Under the cell, Left from the cell, Above the cell, Onto the cell or Free position. The size of the barcodes can be specified in inch or centimeter (country setting). 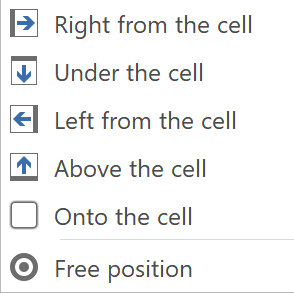 The cell size can be set to the same size as the bar code. Or you insert barcodes that are exactly as large as an existing cell. ActiveBarcode informs you when a barcode is too small or the selected text with the desired barcode symbology is not valid. Assistance functions: The add-in helps you work with barcodes and helps you avoid errors when inserting barcodes into your table. For example, If you want to insert a barcode whose size is too small, the add-in suggests that you change the size to the smallest possible size and performs this function for you. 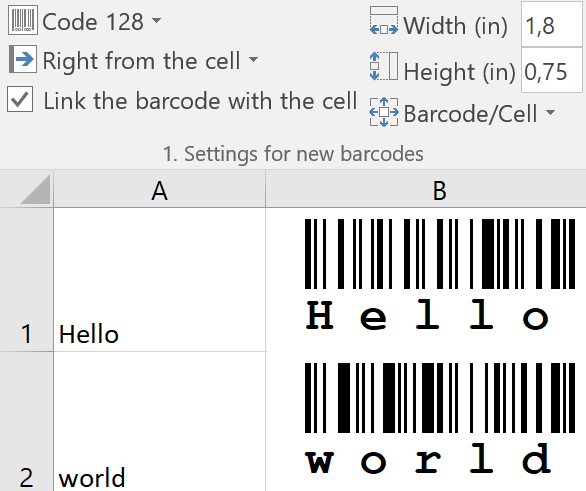 Or, if you are using barcode text that is not valid for the selected barcode symbology, the add-in suggests the use of a formally valid text so that you can start working with valid barcodes. All common barcode symbologies are supported. Check digits are calculated and output automatically. Flexible layout possibilities for colors, alignment, font selection etc. The barcode is freely scaleable and can be rotated (0, 90, 180, 270 degrees). Barcode API for developers (Properties, Methods and Events). Examples and example programs with sourcecode. The Picture property allows developers to use bar codes as you know from the Picture object. For 32-bit (x86) and 64-bit (x64) environments. Get support directly from the developers. Individual customization and enhancement of the add-in is possible according to your needs. 1 The Excel Add-In is included in the ActiveBarcode program package version 6.20 or higher.